These make wonderful toners for the delicate skin on the face. They are made of pure hydrosols and essential oils to gently hydrate and treat your skin. 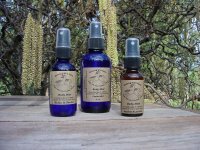 "Hydrosol" is another name for the water that results from the steam distillation process used to extract most essential oils; these are the purest form of floral waters, with many of the same active properties as the essential oils themselves. They are in no way drying to the skin, and smell great! Use between washing and moisturizing your face, or as a pick-up during the day. Available in 1oz, 2oz and 4oz sizes.